Coriander, Red chilli powder, Black pepper, Cumin, Gram dhal, Toor dhal, Fenugreek, Compounded asafoetida, Turmeric, Salt and Curry leaves. Boil 170g dhal and keep aside. Take 4 tbsp of edible vegetable oil. Once the oil gets heated add mustard, chopped onions, curry leaves and fry till golden brown. Take 170g cut vegetables of your choice, tomatoes, ¾ cup tamarind juice, 50g of Aachi Madras Sambar Powder, salt to taste and cook with pre-boiled dhal for 10-15 mins. Now garnish with chopped coriander leaves. 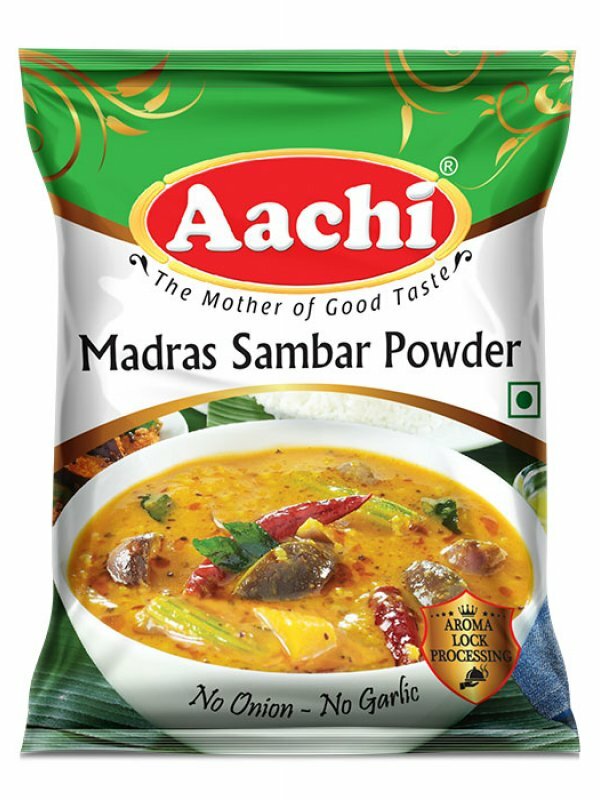 Tasty Aachi Madras Sambar is ready to serve.